Home Software Desktop What’s the Best Project Management Software? Once you get past a simple to-do list and start getting into the heavy-lifting of complex team projects, it’s time to look into project management software. My only memories of my project management course in college are dreadful words like milestones, Gantt charts, and critical paths. Still, when you’ve got a group of people at work on a long-term undertaking with lots of tasks associated with it, you need something to help manage the flow. I asked my Twitter followers what project management software they use at home and at work, and how they like it on a scale of 1 to 10. I got fewer replies to this question than usual, which makes me think lots of people don’t use a PM app to begin with. Out of the 97 replies I did get, 17 said they use 37 Signals’ Basecamp (and gave it an 8 out of 10 average rating), 12 said they used Microsoft Project (it averaged a 6.6 out of 10 rating), and, interestingly, 9 people said they like Things (which averaged a 7.7 rating) and OmniFocus (which got a rating of 9), both for Mac OS X. Of the two leaders, Basecamp and Microsoft Project, the comments were completely opposite: Basecamp is beautiful but in need of more features, and MS Project is ugly but powerful. Several people said they use plain text files, a spreadsheet, or an actual human project manager, and a few (presumably programmer-types) use bug trackers (like FogBugz and Trac) and wikis (like MoinMoin) to do their project management for them. Here’s the full list of responses to the question I posed on Twitter. What project management software do you use at work or at home? How do you like (scale 1-10)? Thanks to everyone who told me what they’re using. Hereâ€™s more on why and how Iâ€™m using Twitter to run surveys like this. Your post is particularly timely and a bit ironic, at least for me. 🙂 I’ve used several and haven’t been particularly happy with any of them, especially the market leader. So I figured that others might be in the same boat so I just launched a website called PM-Sherpa with a goal to help people find the service the meets their needs the best. Right now the site is pretty simple but I plan to add more features as time goes on. You can see it at http://pm-sherpa.com. If you know of a tool we are missing just go to the “Submit” menu option where you’ll find instructions for telling me about other tools. 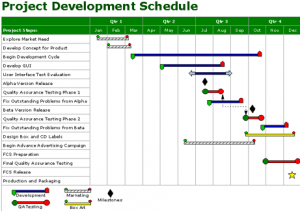 I’m surprised that nobody mentioned the big daddy of all project management tools – Primavera. Whether it’s the classic P3 or the newer P6, there isn’t a better project management tool out there. I give it a 10! It is a silverlight no-login online application that shows google spreadsheets as Gantt projects. I am with Brooks – serious Project Planners (often contractors) use Primavera. Client Project Managers of large projects in large corporations often have to incorporate Primavera results into Microsoft Project which can be 1) directly accessed by other Project Managers and/or 2) translated into Microsoft Power Point presentations for Management. I was looking forward to seeing the results of your survey and I’m a bit surprised at the outcome. I have used both of the top 2 tools and while I like Basecamp, there are plenty of things that are missing in order for me to consider it a comprehensive Project Management tool and MS Project has such a high learning curve and generally requires an FTE to maintain it’s not ideal either. Obviously we’re biased but check out ProjectSpaces – http://www.projectspaces.com – an easy to use online project management tool. Sign up for a free thirty day trial today! Orchestrate is a resource scheduling app, it focuses on scheduling people to perform tasks at locations based on their qualifications. Here’s it’s review on Techcrunch, it wont suit everyone, and it doesnâ€™t have Gantt charts. I think maybe a lot of people don’t consider what they do from day to day to be “project management”, as much as collaborating with clients or team members. We created ClientSpot to support that kind of informal project collaboration, and it’s been well received, especially by virtual professionals. I suggest you to take a look at Teamwork, a great work management software. I would recommend Comindwork.com – integrates MS Project Gantt charts and Basecamp. You may create Gantt charts online (or import from MS Project files) and also fully synchronize with Basecamp account (everything, even files). I am looking for a hosted solution and like what I see with CreativeOffice Pro, especially the Job Timer, but am concerned about the lack of activity in the Forums. I had posted a question and emailed the developer about the ability to manually add time spent on a task but haven’t heard back from either. Based on their most recent blog, I think they’re moving away from a hosted solution.